Come experience the cheese-making process and try samples of various ages and flavors of our Frisian Farms Gouda, including fresh curds at the new Frisian Farms Cheese House! 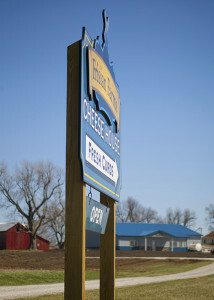 The Frisian Farms Cheese House is conveniently located just off of Hwy 163 between Pella and Oskaloosa, IA. You will love our Gouda cheese. It is a semi-hard cheese named after a Dutch town in the province of South-Holland, and accounts for more than 60% of the cheese produced in the Netherlands. Cheese making is both an art and a science. Our cheese is made using the original techniques mastered in Holland over hundreds of years and produces a cheese that reflects that perfection. Come experience Gouda done the Frisian Farm way! We had a great ending to 2018. Thank you to all of our fabulous customers! Just a reminder that our winter hours are now in effect.